British Army co-operation biplane. The Hawker Hector was an 600kW / 805‑hp Napier Dagger air-cooled and supercharged powered derivative of the Hawker Hart produced to meet a 1935 specification for a replacement for the Hawker Audax, itself a development of the Hart. The H‑type Dagger IIIMS 24-cylinder gave the Hector a distinctive nose profile, while other modifications included an upper wing with straight leading edge, a tail wheel in place of the original skid and a canted ring for the Lewis machine‑gun in the rear cockpit. 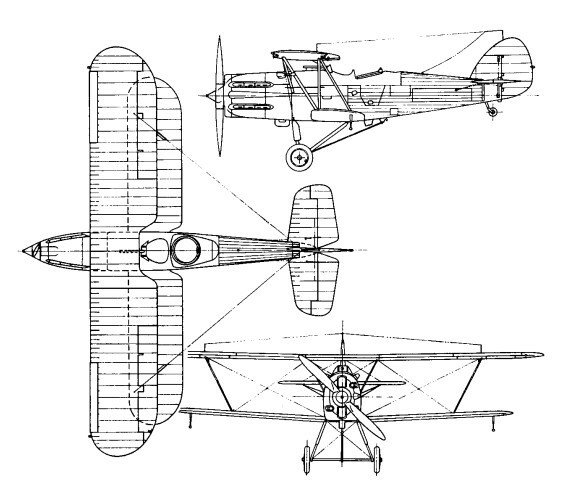 A 0.303‑in (7.7‑mm) Vickers was fitted in the port side of the nose, and two 51‑kg (112‑lb) bombs could be carried below the lower wings. The prototype Hector, a converted Hart which first flew on February 14, 1936, was followed by 178 Westland‑built production machines, the first of which entered service in February 1937. At the time of a Finnish evaluation, the Hector equipped seven RAF army co-operation squadrons, although the Finns were also advised that it was intended to start replacing the Hectors in RAF service in 1938. The Ilmavoimat / Maavoimat / VL Team expressed considerable disbelief among themselves that in early 1938 the RAF was still flying an aircraft reminiscent of the first World War, particularly in light of the German aircraft designs they were also looking at. Their initial conclusion was that the aircraft was unreliable, obsolete and would be ineffective in its intended role. The Hector was eliminated from the evaluation with no further consideration. Only a handful of Hectors were ever flown in anger, raiding German positions in occupied France in May 1940. After the Lysanders started entering service, the Hectors were transferred to RAF Auxiliary Air Force squadrons; 613 Squadron used theirs to attack German troops advancing through northern France in May 1940. Two aircraft were lost in combat over Calais, before the squadron was evacuated. Hectors were used by the RAF from 1940 as target-towers, and for towing the General Aircraft Hotspur training gliders. The type was deeply unpopular with ground crews due to the complicated nature of the engine, which had 24 cylinders, with 24 spark plugs and 48 valves, all of which required frequent maintenance. Britain sold the Irish Free State 13 of the Hectors after the Dunkirk Evacuation. In general they were in poor condition. They were sold by the British War Office to the Irish Free State upon requests for aircraft. The Irish military were wholly unprepared for major warfare, but still relied almost totally on military supplies from Britain. The defence of Ireland was also in the British interest, but with the Battle of Britain raging in the skies, could afford to sell the Irish Government nothing better than the Hector.